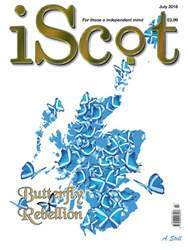 Digital Subscriptions > iScot Magazine > July 2018 > Howzat England! AN OLD fashioned Australianism meaning - it’s not right! If you were a Scot living in Australia and you said you were a massive cricket fan, what reaction would you expect? I mean…Australia? The world’s greatest, no (ooops)…most recently shamed cricket nation. But seriously what do you think, prescandal, the average Aussie’s reaction would be? Moreover, what do you think the average English person’s reaction would be? Well, jokes apart it could be said that it’s just not cricket but to be honest, I’d say it would depend on the Aussie or English person. If the person was informed and broad enough minded they would know what to say. If, on the other hand they were somewhat,…uninformed, they would have a good laugh. But a cricket loving Scotswoman is a bit of an oxymoron to some folk.